Pie. It’s on my mind. As the air gets cooler and the leaves begin to change color, my mind turns to pie. Pie and the holidays just go together. Warm smells of spices, buttery flaky crusts – it evokes comfort and cozines. So let’s talk pie. Apple pie to be more specific. This is the BEST apple pie there is, are you ready for it? 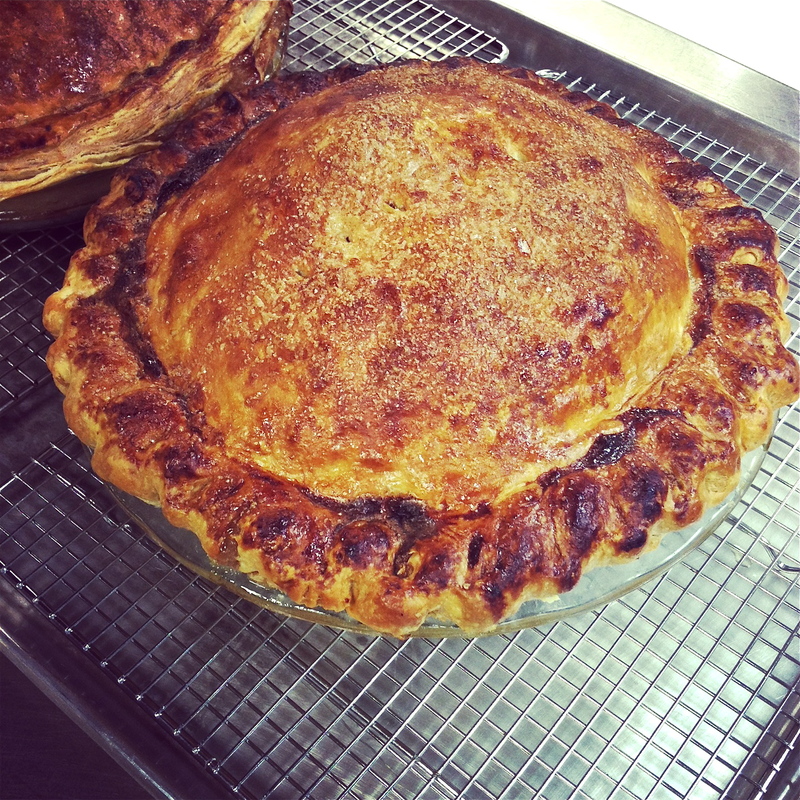 I recently had the pleasure of attending an incredible Pie Making Class at the New School of Cooking in Los Angeles. Teaching the class were Sherry Yard and Evan Kleinman. I mean pause and think about just how awesome that is and how amazing pie made by their hands would be. I did and I jumped at the opportunity to be a part of this class. The pie – it was life changing. While you may not bake quite as well as Sherry Yard, you can certainly give her recipe a go. Here it is (below) and if you need some pointers the New School of Cooking offers fun classes for all levels. They’re gearing up for the next session of their 6-month advanced professional culinary and pastry programs kicking off January 6th (hmm sounds like a good Christmas present eh!). Cut the apple quarters in thirds crosswise. Combine in a bowl with the Calvados, lemon zest, lemon juice, sugar, flour, salt, cinnamon and nutmeg. Roll out half the cold dough and drape it over a 9 or 10 inch pie pan. Let the dough hang over the rim by about ½ inch. Don’t pull or stretch the dough. Doing so will make the crust uneven. Fill the pie shell, mounding with the apple mixture. Brush only the edge of the bottom pie crust, along the rim, with the egg wash. Water works well here, too. This step will help the top crust adhere firmly to the bottom crust. Roll out the remaining dough. Top apples with this second round of dough. Trim the edges so that they hang over the rim by 1 inch. Gently tuck edge of top crust under the bottom crust and crimp the two together with your fingers. Brush entire top crust with egg wash. Sprinkle with sugar. Cut air slits. Place the pie on a sheet pan and place in oven. Bake 10 minutes at 425, then turn oven down to 350 degrees and bake for 1 hour to 1¼ hours, until crust is browned and the juices begin to bubble out. Serve warm. Cut the butter into 1 inch pieces and place it in the freezer to chill for 15 minutes. In the bowl of a standing electric mixer, sift together the flour and sugar. Fit with paddle attachment. Add butter and salt. On low speed, mix for about 2 minutes. Stop mixing and by hand pinch flat any large pieces of butter that remain. Combine the ice water and vinegar in a small bowl. Turn the mixer on low and add the liquid all at once. Pulse mixing just until the dough comes together, about 15 seconds. Remove the dough from the bowl and wrap in plastic wrap. Chill for at least 1 hour. After properly chilled, roll out the dough on a lightly floured surface to desired thickness. Sherry: Always, always…ALWAYS pre-bake your pie crust for a custard filled pie, like pumpkin for example. I use a clean daisy-shaped coffee filter sprayed with oil out of an aerosol can to line the shell. Then another one on top, also sprayed lightly with oil. Then I put the beans or pie weights in the filter. Bake the shell at 375-400 degrees till it’s almost done. The pie weights lift out easily with both filters. Then pour in your custard and finish baking at a lower temperature. 300 degrees. Evan and Sherry: We agree that a slice of pie has the perfect filling to crust ratio. Miniature pies often have just too much crust. In this case, bigger really is better! We both love Pyrex to bake our pies in. Sherry: People like to crimp the edges of their pie, but I like to cut mine with scissors. That straight edge shows off all the hard work you did to create a beautifully layered, flaky masterpiece. This mini master class in perfect pie making drew to a close and I’d completely forgotten that I needed to go home. Fortunately I did not get pulled over for driving under the influence of too much pie! Evan and Sherry were delightful. Their blend of craftsmanship, technique, wisdom, encouragement and fun (the lol kind) was as balanced as any one of their delicious creations. 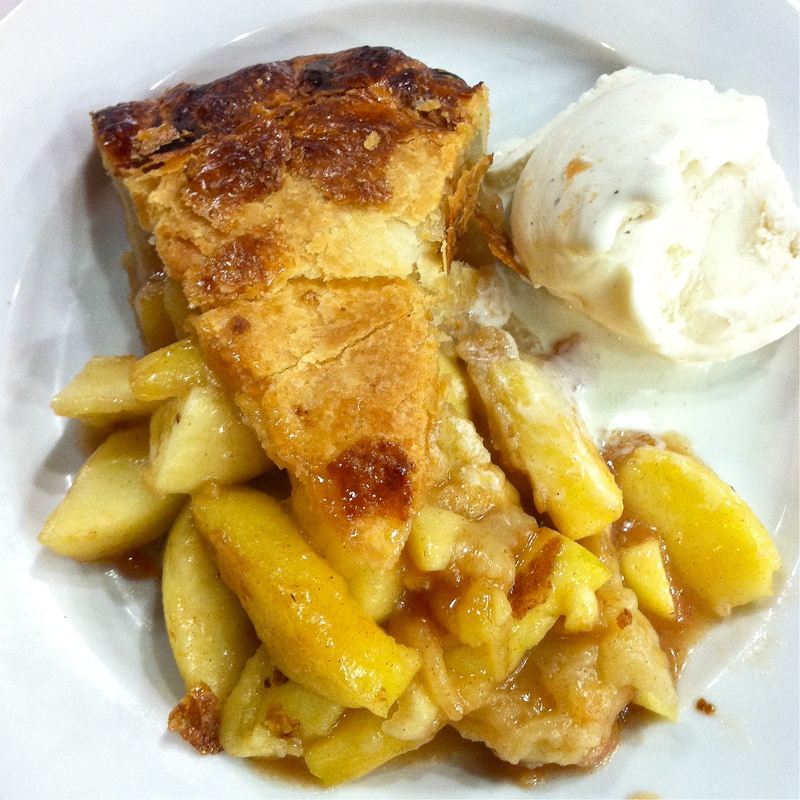 Remember to go to KCRW.com/goodfood and enter your pie in this year’s cookoff. Evan’s final tip…make sure the bottom crust of the pie is cooked! The End. Previous PostPrevious National Donut Day! Corn dogs, churros, pineapple ice cream…Disneyland! I went to the same class and never really cared for apple pie. UNTIL THEN!! Evan Kleiman and Sherry Yard are and were amazing. I’m making her pie for Thanksgiving. Your blog is fun & inspiring . . . and pretty too! Now that fall is on its way this Apple Pie recipe is filling me with anticipation!! Can’t wait to try it out, Thanks!